More often than not, people only replace their router when it stops working. But there are always reasons to upgrade your router, or otherwise expand your existing Wi-Fi network. Especially with the fast rate at which wireless technologies have been growing. Ending up with a router appropriate for your needs is really about understanding the kind of traffic you expect your network to experience. It used to be imperative to think about the coverage area of your network, too. But with the help of mesh technology, those kinds of issues have become something you can address with relative ease. 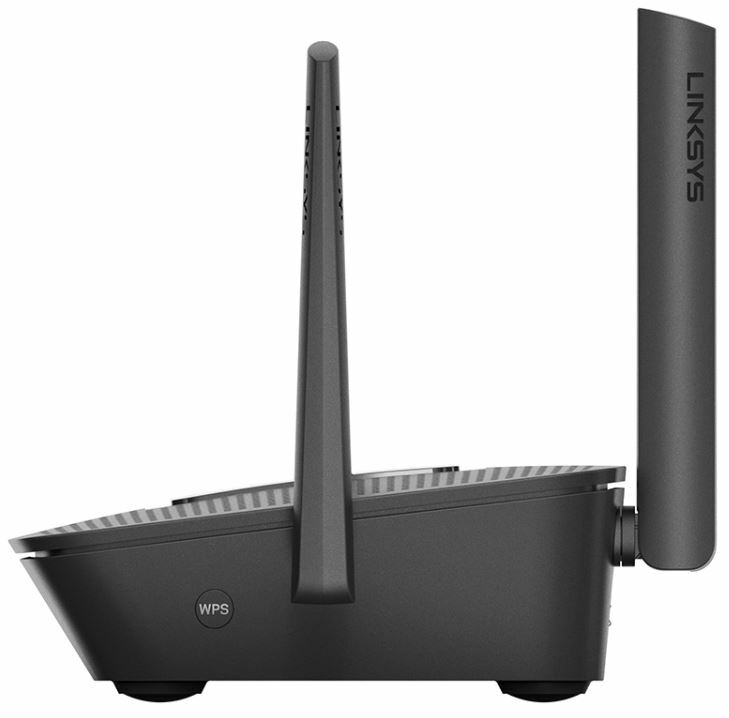 In many respects, the Linksys MR8300 comes close to being a niche device intended for a niche audience. One thing might confuse you at first, it’s bandwidth capacity isn’t exactly reflected in the price tag. For equipment in this price range, you might expect to be able to haul a couple more Gigabits of bandwidth. 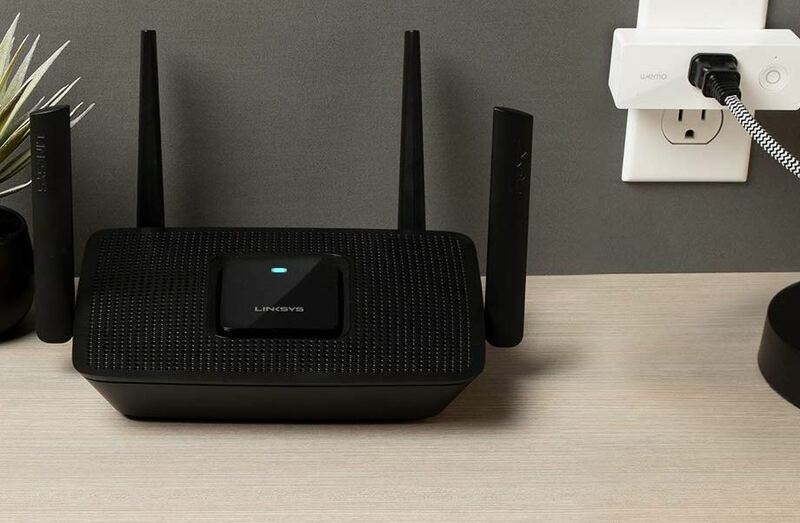 But instead of focusing on what is likely to be superfluous raw bandwidth capabilities, Linksys designed their Max-Stream AC2200 Tri-Band Mesh Wi-Fi-Fi router to do something else. The MR8300 was made to support what could be called a high-density network. It’s built to provide connectivity not for two or three people, but about four dozen separate connections. That’s ideal for setting up a smart-home, a retail space, or anything between. This router’s range is best characterized as suitable for a medium sized household. That’s something in the ballpark of 2,500 square feet. 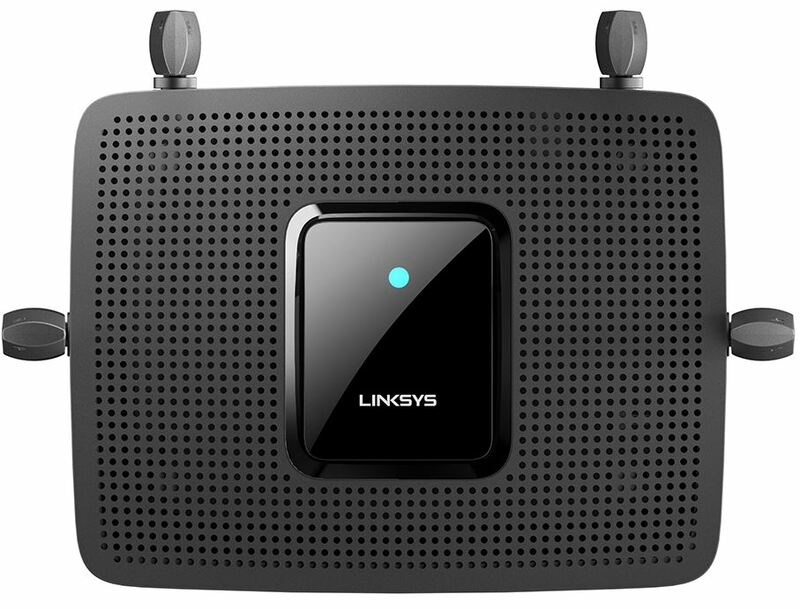 Not exactly an incredibly large space, but if you do end up needing to extend your network, Linksys included Velop Mesh technology. This router doesn’t use every modern Wi-Fi standard, and isn’t what you would call totally future-proof equipment. Though the bandwidth potential of this equipment is low-average relative to its price, that’s really not the point of the MR8300. This is a device intent on providing a particular depth, stability, and expandability to your network. The MR8300 measures 7.3 x 10.1 x 6.3 inches. Its tall height is almost entirely due to the antennas. If you can ignore the antennas, it faintly resembles an old digital answering machine. Because you can’t actually ignore the antennas, this build is slightly bulky. It takes up a fair amount of desk space, and it can’t be wall-mounted. On the backside of the MR8300 you’ll find four Ethernet ports and one WAN port. Unfortunately, all of these ports are labeled using the same yellow coloring. The WAN port is placed on the end of the row, and it’s probably distinct enough as to avoid confusion. There’s only a single USB 3.0 port, but one should be enough for a router built to this scale. Like you may expect, you can use that port to attach a drive, and then distribute content across your network. Because it’s a USB 3.0 port, there’s a pretty high ceiling on the kind of bandwidth throughput you can expect from those transfers. Normally, a router like this would include a full row of different LED icons. In this case, Linksys used a single multicolor LED on the topside of the device. The LED can change colors and blink to help let you know what’s wrong with the network. For people who have already memorized every network icon that occurs on the front side of a router, this might not be convenient. But for everybody else, this system is far easier to approach. Whether you’re trying to solve network problems yourself, or you’re trying to get help from tech support. If the MR8300 has a blinking yellow light, that’s terribly easy to communicate to others, or to search for in order to solve the problem yourself. Another thing you’ll find is a red reset button. For some reason, Linksys often decides to make their reset button highly accessible. Some of their models use typical positioning, seating the reset button deep inside the chassis itself. That way, people have to use a pin or needle to use the button. You have to deliberately hit the reset button when it’s positioned in this manner. The fact it’s bright red should prevent many people from accidentally pressing it. That means restoring the out-of-box settings for the MR8300, and wiping away your current network options. But make no mistake, since it’s not recessed inside the chassis, this button is prone to being flicked on accident. It also makes this equipment slightly less suitable for being positioned in public spaces. With those caveats aside, if you can trust yourself to not accidentally bump the button, it’s not hard to appreciate better accessibility. You probably don’t always have a pin or needle when you need it, after all. 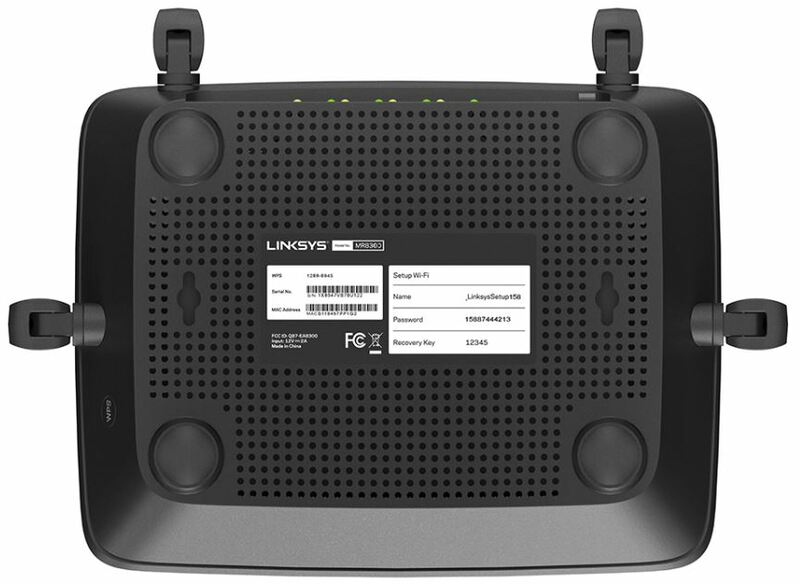 The Linksys MR8300 is constructed around a fairly unimpressive 716Hhz Quad Core processor. Though it’s not the strongest processor you’ll find inside networking equipment, it does happen to have power proportionate to the kind of throughput this equipment was designed to handle. It’s only when you run 50 concurrent connections on the network that you’ll really encounter problems with the processor’s power. Entertainment is delivered through tri-sand speeds of 2.2Gbps, which should be clear from the AC2200 portion of this device’s name. That 2.2Gbps is composed of 400Mbps on the 2GHz band, and an additional pair of 867Mbps connections on the 5GHz band. 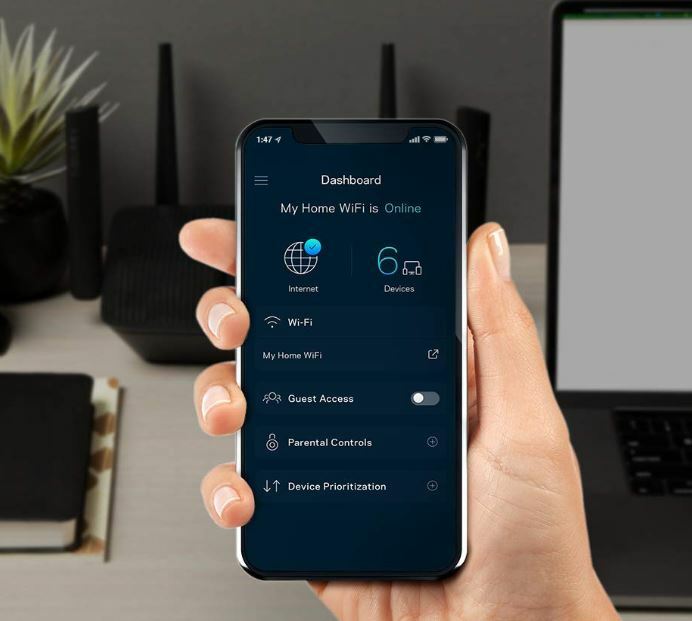 Those connections are made with the help of four external adjustable antennas, which are hard to miss atop the Linksys MR8300 Tri-Band Mesh WiFi Router. The MR8300 makes use of dedicated signals to deliver them, along with the help of MU-MIMO. Consequently, the MR8300 is made to make to support several high speed wireless connections. That way, even your mobile devices can take advantage of 4K streaming content. The result is similar to having independent routers for each of the bandwidth-hungry devices on your network. Of course, actually getting your network to perform that way depends on the physical setup location of the hardware. To take advantage of MU-MIMO, you basically need line of sight with the router. When your equipment can’t stay close to line of sight, it’s unable to use the 5Ghz band, and consequently unable to take advantage of MU-MIMO. Mesh WiFi Technology lets you add a Velop Mesh WiFi node. If you find yourself in a situation where you need to extend your network, being able to add on another node makes things pretty simple. Whether or not you currently have a Wi-Fi dead zone isn’t really the point. It’s that you have the option to scale-up your network, and create simple solutions if a dead-zone should develop. For instance, if you move the router to a new location and begin encountering issues, it would be terribly easy to fix. You might place one Wi-Fi node on the second floor of a building, and then use an additional node on a third story. But you don’t actually need to use elaborate setups to use the MR8300. With respect to software, this equipment can be setup by following along with the included Linksys app. You basically just install the app, connect the equipment, and then give your network a name and password. After your network is configured, the app continues to be useful because it allows you to see what’s going on inside of your network. For instance, it might tell you that six devices are connected, and inform you about your current bandwidth consumption. And it’s from here where you’ll be able to access guess controls, parental controls, and device prioritization. The app allows you to manage as many as 50-guests, and create separate wireless networks specifically for those guests. 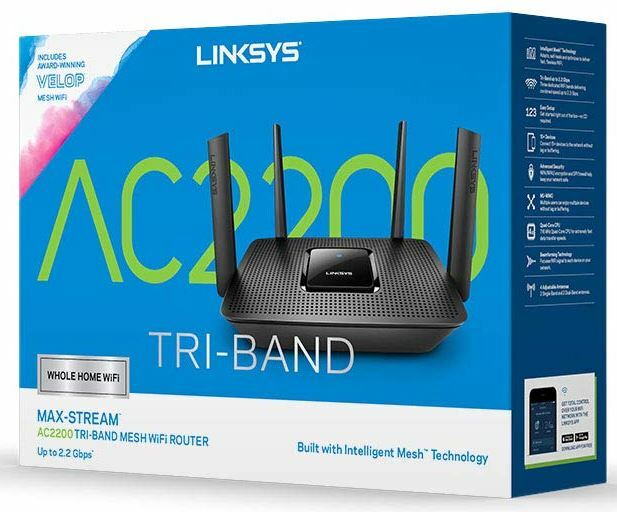 Linksys includes automatic firmware upgrades for the MR8300 Max-Stream AC2200 Tri-Band Router. Whenever there’s a new update, you won’t have to head to their website and dig it up. You won’t have to try and remember your equipment needs to be updated at all. Turning to the parental controls, you’ll find they offer the typical settings you’d expect of almost any home router these days. You can restrict certain types of content, control hours of use, or block specific devices at specific times of day. Apart from that, it uses standard 128-bit WPA2, WPA-Mixed, and WPA2-Pesronal encryption. Really nothing to complain about. Inside the app, there is also a handy speed test feature that can let you monitor the speed you’re currently drawing from your internet service provider. If you encounter a network issue and you want to determine if the problem originated from you or your provider, tools like that can be pretty handy. If there’s one weakness in this router, it’s the fact that it’s still using 802.11ac network standards. That’s not going to affect the performance impact of this equipment at all. And for virtually all people in all circumstances, it won’t be worth going out of your way to use the latest AX standard, also known as Wi-Fi 6. But it’s a limitation that’s worth noting. 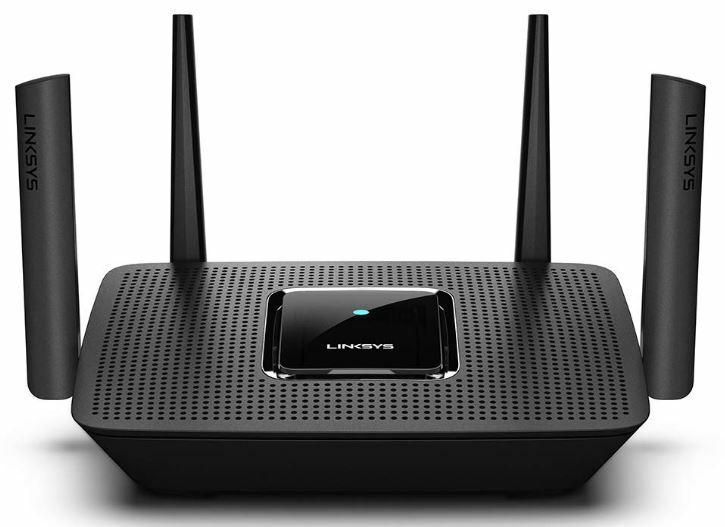 Who Should Choose the Linksys MR8300 Tri-Band Mesh WiFi Router? The MR8300 is designed to be easy. From its installation to the execution of your network on a daily basis, everything was made simple. Security controls using the Linksys App are accessible. Even doing somewhat sophisticated tasks, like creating separate guest networks, is really much easier to do. 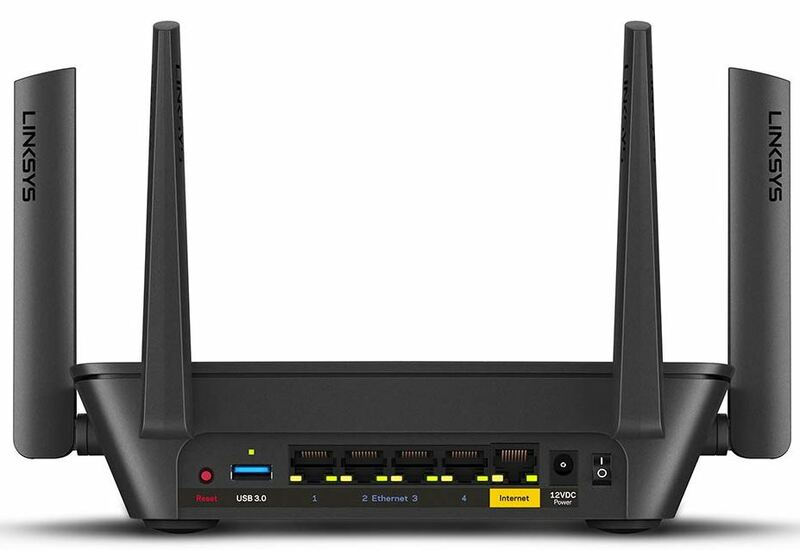 Though this router doesn’t advertise itself as an entertainment router or a gaming router, being able to manipulate device prioritization settings means this equipment is perfectly suitable for those kinds of network tasks. Moreover, simple doesn’t mean limited. In fact, the MR8300 has almost limitless expandability. As a result, the Linksys MR8300 Tri-Band Mesh WiFi Router is a good choice for most people looking for a mid-shelf router that regularly sees high-bandwidth usage. If you didn’t need all this power, you could find a more economical choice, perhaps one with a reset button that wasn’t positioned on the outside of the unit. But then again, the MR8300 does provide room for growth.